Families in Beslan are facing a third day burying their dead as the Russian government comes under growing pressure over its handling of the school siege. France's prime minister has joined calls by Russian papers for answers amid concern the authorities tried to play down the scale of the tragedy. At least 335 people, half of them children, died in the bloody siege and a further 200 are unaccounted for. Russia is now in its second day of official mourning for the victims. As on Monday, state flags are flying at half mast, and all light entertainment shows have been taken off the television schedules. More than 100,000 people are expected to attend a rally promoted by the government outside the Kremlin later on Tuesday to condemn terrorism. But there is also rising concern about the exact events that led to Russian special forces storming the school on Friday. France's Prime Minister Jean-Pierre Raffarin, while expressing solidarity with Russia, said he wanted all the necessary information about what had happened. He echoed comments made by Dutch Foreign Minister Bernard Bot a couple of days ago, which prompted a furious reaction from Moscow. Russia's newspapers have also been asking questions. Even normally pro-Putin papers, such as Moskovsky Komsomolets, are critical of the government's handling of the crisis. And journalists and media organisations claim some reporters have been prevented from covering fully the events in Beslan. The editor of one of Russia's biggest newspapers, Izvestia, said he was forced to resign on Monday because the paper's coverage was considered too emotional. Arabic television station, Al-Arabiya, says its Moscow correspondent was arrested on his return from Beslan, and Georgia says two of its journalists had been detained. Meanwhile, BBC correspondents in Beslan say anger in the town, with a population of some 30,000, is being directed at neighbouring Ingushetia. Although it remains unclear who the hostage-takers were, many Ossetians are convinced extremists from its long-standing rival were involved. The Russian authorities said there were 10 Arabs among the hostage-takers, although not a single Arab body has been produced. State television has broadcast footage it said was of one of the hostage-takers in captivity. The man, shown in handcuffs, said the group consisted of Uzbeks, Arabs and Chechens and told the goal was "to unleash a war on the whole of the Caucasus". With 200 hostages still unaccounted for, a meeting is being held in Beslan's central square on Tuesday. 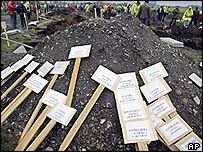 Large crowds of people still desperate for news are expected to attend, reports the BBC's Sarah Rainsford in Beslan. 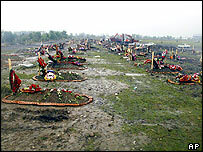 Fresh graves were being prepared overnight at the town's cemetery for more funerals. Correspondents spoke of heartbreaking scenes on Monday as thousands of people buried nearly 200 victims of the tragedy. The sounds of wailing echoed through the streets as procession upon procession headed towards the cemetery in the wind and rain. Hundreds of people also visited the burnt-out gym of school Number One, where the hostages were held and where so many died. A shrine of flowers, toys and candles was erected. Water and food were also left - for hostages who were denied such basic necessities during the siege. The Russian Red Cross has appealed for international assistance to help overstretched local hospitals trying to treat the injured - who now number more than 560, according to the authorities. The US military has flown in 15 tons of medicine and equipment and at least two other aid flights are expected. It is thought more than 1,100 people were held hostage in the school during the three-day siege, although there is no official figure yet. The children were celebrating the start of the new school year with parents and staff on Wednesday morning when the heavily-armed gang took them hostage. The crisis ended in massive bloodshed on Friday after bombs rigged by the hostage-takers went off inside the building, and Russian troops moved in. Authorities say at least 335 people died, but unofficial figures suggest the real number could be closer to 400. "This is a town drowning in collective grief"